Come check out my new blog. I’ll still blog here – but I’m broadening subjects and focusing on style, stories, fun and friends at It’s a Bloggable Life. 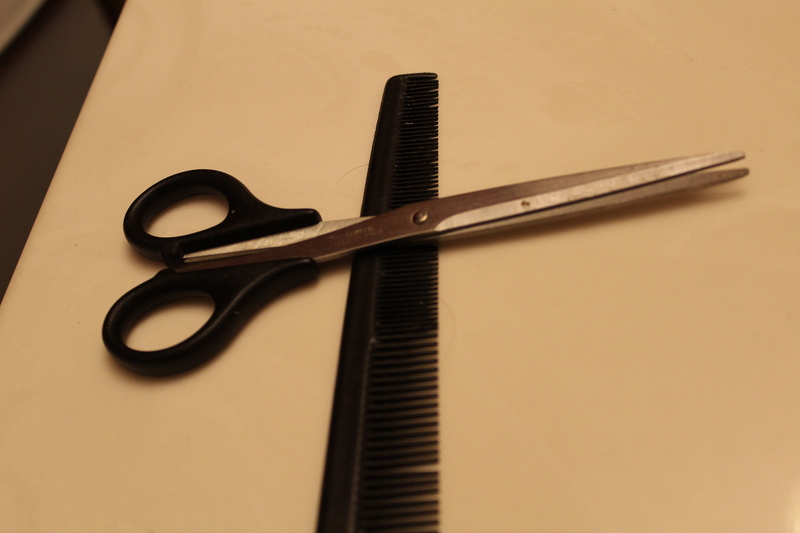 I wanted to do a daily hands-on activity Lenten activity with the two littlest ones. My first idea was to trace their feet and cut out 40 for each. But when my neatnik Cliff would have nothing to do with the feet tracing activity, I had to compromise. Once Lillian saw me come up with a graphic of a foot, she had design plans of her own. What we ended up with was pretty much directed by her. I used Word and Photoshop. I made twp footprints in Photoshop’s custom shape feature and colored one pink and one blue. (You can guess who came up with that). I saved them as jpegs and pulled them into Word, added a cross on, and an empty heart near each foot (also directed by Lil) and the text: “Walking the path with Jesus brings my heart closer to his.” I printed a total of 40 in each color. The kids each fill in the heart daily with a picture (or scribble ala Cliff) and the number of the day of Lent. It’s hardly craft-0-licious – but it works. We’re tacking them up the wall and they will work their way along the ceiling (eventually leading to a hung crucifix). The children are already excited to see the path grow. I’m not usually a let’s-tape-stuff-to-the-wall mom, but I’m repainting in the spring, so I figured let’s go with my unusual flexibility while the going is good. Here’s a pdf of what I made: Path of Lent. It’s a nice activity because it’s not too overwhelming or time-consuming, but it is still a multi-step and multi-sensory process. If you’re not for the wall-walking, collecting them in a box would be fun. You could occasionally spread them on the floor (adding a little sequencing exercise to boot). The activity has already prompted some nice conversation, engagement and an opportunity to build on their knowledge of this holy season. Today (since all are home for break) we are making an Alleluia banner to bring out on Easter. We’ve done this before (usually on Ash Wednesday), and it adds to the celebration (and decor!) of our Easter. And yes: there will be glitter involved – because making all things new has to involve lots of sparkle, right? Why start in mid January what you can put off until Lent? In addition to prayer, alms giving and fasting – I’m planning a resolutionary Lent. I missed the opportunity to seize my few planned resolutions for the New Year since the kids and I were sick in bed the week before, during and after the clock struck midnight. Two weeks into January, I didn’t have the wherewithal to tackle the self-improvement tasks I had intended since I was in a semi-scramble trying to make up for all the lost time, deadlines, projects and whatnot that the flu dutifully mangled. I’m all about Lenten sacrifices, and for some reason (like my personality), I continue to add sacrifices in the form of projects as the season progresses. And, I generally over-do it. In years past, I’ve gotten rid of 40 bags of stuff. Twice. Written 40 letters for life. Taken care of 40 menial tasks (the little fixes that never seem to get done) – all while leading a prayer group, doing Lenten activities with the kids and checking off “pray more” on my mental to-do list for the season. No matter what, I feel like I end up conquering Lent. And here I am again: planning to add a resolution (or two or three). Not too terribly long ago, I was a normal person who woke to an alarm. But over the past couple years, the protocol is that Richard makes me coffee (in a French press and with frothed milk, no less), and brings it to my bedside. As much as I appreciate this (and oh golly I do! ), I really need to get up on my own and not be dependent on this glorious gesture. I need to seize the day – not be eased into it. He can still make me coffee (and I hope he does), but I need to re-learn how to get up outside of this ritual. There’s no consistency in the timing. Which I need. Some mornings, I’m awake and stay put in bed, waiting for that cup of coffee. I almost feel (gasp) entitled to that coffee in bed. Which is ridiculous. (Who am I? Zsa Zsa Gabore? “Thank you, Darling?”) Giving this up really is a sacrifice – because, I so love the sweet thought behind it. But it’s also a resolution – because self-improvement will come from this change. I don’t intend to go back to the practice after Easter, and I resolve to readily seize the day and offer the fruits it brings to the Lord. I want to believe Punxsutawney Phil. I’m longing for spring – the thought of which has wedged itself in my brain like a steel spike. Well, on the bright side, there’s always Lent to look forward to. Here’s a look at a huge crowd of people cheering on the rodent. I suppose the tradition gives folks the excuse to start drinking early in the day to celebrate the coming of spring. Or to start drinking early to drown the sorrow of the long weeks of winter ahead. Either way. Cheers. 1) I had a very productive morning, even if it got off to a slightly later-than-usual start. Fingers were flying. Words knocked out in cohesive sentences. And I made a run to get some summer clothes for a south-traveling kid-o-mine who has nary a thread to wear from last summer. 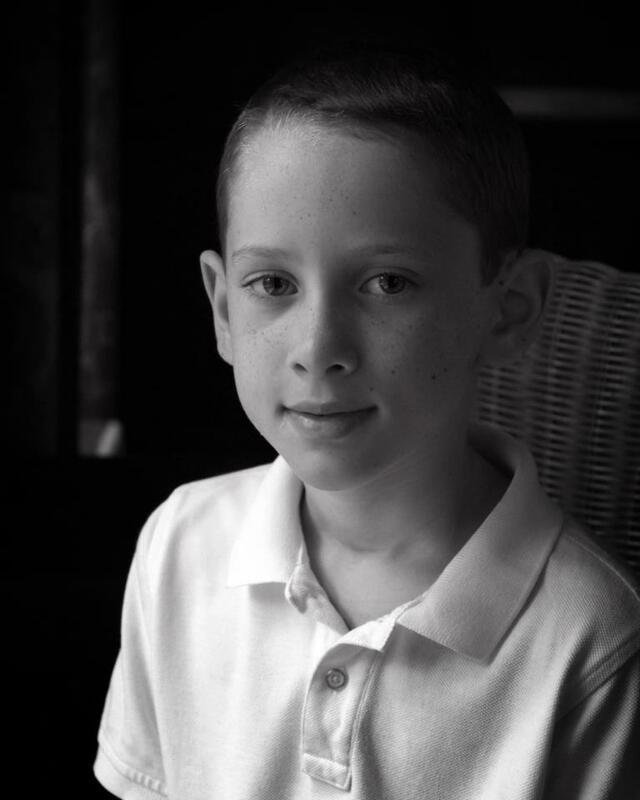 3) Just as I was starting my van to head to teach children’s choir, I did a mental survey of the farewell conversation I had with my 11-year-old. In my mind’s visual super-slo-mo playback, I realized that while I was packing music, he was cutting open an entire package of bacon and putting it – as one big overhanging hunk – on a salad plate. Wait. I thought. What the heck is he going to do with that? Success! I ran inside, cut the impending action and prevented the gory greaseshed – and one serious microwave (hot) mess. This lovely artwork was Henry’s Christmas gift to me. He made it at the famous Pewabic Pottery center in Detroit. Yes. It says bacon. And Tea. Because he loves bacon, and I love tea. Except he spelled tea wrong. 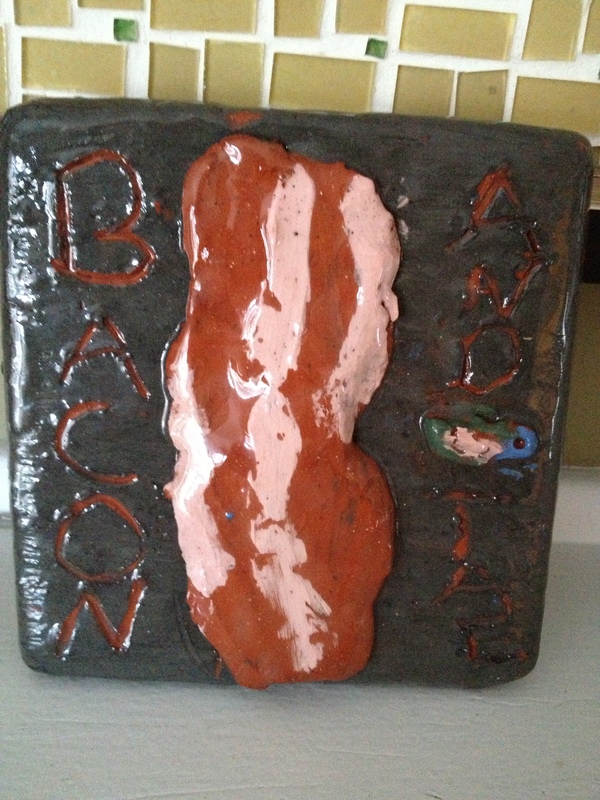 Which he knew, but “there was no turning back once I gouged it in the clay.” That’s my boy: The bacon-loving clay gouger. He reminded us that we have to renew our commitment to the season. That it shouldn’t just be the same old thing – unless that same old thing helps you prepare the way. I don’t work that way. As much as I love tradition, I’m always looking for a little fuel to keep the lamps trimmed and burning, not just for me, but for our family. Having recently completed a stewardship campaign with the children of our parish, my heart is still very much focused on our gifts: recognizing what we have received, and what in turn we give back to and in the name of the Lord. That’s when Johnny Whitaker entered my mind. Herman Munster welcomes Jody to Heaven just before they board the chariot bathtub to the little shop of halos. I loved the 1969 movie version of the story The Littlest Angel starring Jody (aka Johnny Whitaker) and Herman Munster (aka Fred Gwyne.). Okay, maybe I just loved Johnny Whitaker. But heck, Cab Calloway and Tony Randall are in it, too, and a crew of other celebs I couldn’t name when I was a tot. So an endearing memory of 117 minutes of the worst green screen ever used in the made-for-TV movie of a theologically flawed but sweet tale has become our seasonal inspiration for our Simple Gifts (aka The Littlest Advent) activity. It’s already proven to be a big hit with the kids as they eagerly ask for our Littlest Advent time each evening. I used a plain balsa wood box from Michael’s ($5) to create a simple treasure box. An old shoe box would do. Whatever works. I wanted to keep ours, so I invested a little in the box. We sprayed the box gold using a can of model paint we had on hand – to represent treasure. But we still kept it simple (fighting my temptation to glitz it up). My husband cut a slit in the top of the box so the kids could easily slip in the sticks. I put the sticks in a little basket next to the box, with color-coded examples. This is how I presented it to the kids … we talked about how Advent is a time for preparing for Christmas. As we eagerly await the celebration of Jesus’ birth and plan our gift giving to our family and friends, what simple gifts can we give to the Baby Jesus on Christmas? We had a discussion about God being the giver of all things and about us giving back to him from our hearts. Help – offering our service to our parents without complaint, helping our friends when they are need, giving to the poor and lonely, sharing our gifts at church, etc. Each evening, we say some appropriate Advent prayers as a family and then tell each other the “simple gifts” we’ve offered during the day. The children come to me, and I give them a stick corresponding with the gift. The little ones eagerly put them in the box. Our 15-year-old participates, too, appreciating how excited her siblings are over the process. You can see from the contents that the box is heavy on prayer. Which is great – but I’ve had to take to rationing those sticks to one for the each kids’ daily private prayer, one for community prayer, etc. Otherwise I’m hearing, “I prayed for the priestesses.” (That’s how Lillian says prays for all the priests.) I give her a stick, and she comes right back with, “And I prayed no one ever dies. And that people don’t get sick. And that people have peanut butter …” Expecting a stick with each one. I think I do a good job not morphing into a Stick Nazi with a harsh “No stick for YOU!” and instead just listen and send her on her on her merry way to think about the other categories. Every day, I give Cliff a stick after he tells me he prays for our pastor with: “I prayed for Meaner Mike.” (That’s monsignor to you and me.) And “The Headless Horseman.” We went here, and the impact has apparently been profound. He wants God to help that guy to find his head. It’s been a great opportunity to teach both little ones to better contemplate their petitions, because in addition to Meaner and the headless dude, Cliff’s added to his prayers children from school, grandparents and other family members and friends. Lillian’s prayer seems to have a broadened focus on death and dying for some reason, but her concerns are sincere. This weekend, we will watch that gooey 1969 version of the story. (I know, I know: Judge me.) I bought the DVD for a whopping $4 online. I can distinctly remember being a kid and handing my mom the TV guide asking her to find when it was scheduled in the weeks leading to Christmas. i remember one year being perplexed and jdisappointed when she couldn’t find it. I wonder how many years it was actually played on network TV. It didn’t seem to have the staying-power some other Christmas specials enjoy. Two reasons: 1) no Santa, and 2) if you watch even some of it on YouTube, you can easily see why. Cutting-edge special effects it has not. I am aware there is a newer cartoon version of the story, but I can tell by the images that it features a Precious-Moments-eque cartooning style that doesn’t meet my aesthetic. I’d much rather see Felix Unger singing while suspended in front of a groovy swirling tie-dye backdrop than big-headed soulless ink-eyed cartoons talking all cartoony. A few days before Christmas, if we’re adventurous, we’ll work our way through the picture book of the story. We’ve read it a handful of times over the years. I find the text rather cumbersome to keep a three-year-old (and my husband — who does the reading) engaged. I love the story, not so much the language of the story. On Christmas Eve, we’ll have the kids put the box by our small crèche. I would like to replace the contents with something meaningful – maybe related to guardian angels or similar – but I’m not quite sure what yet. Of course, as Catholics, there’s a little bit of undoing that needs to be done surrounding this sweet story (just like It’s a Wonderful Life). We are taught that when people die, they become saints in heaven, not angels. Angels are and always have been pure spirit. 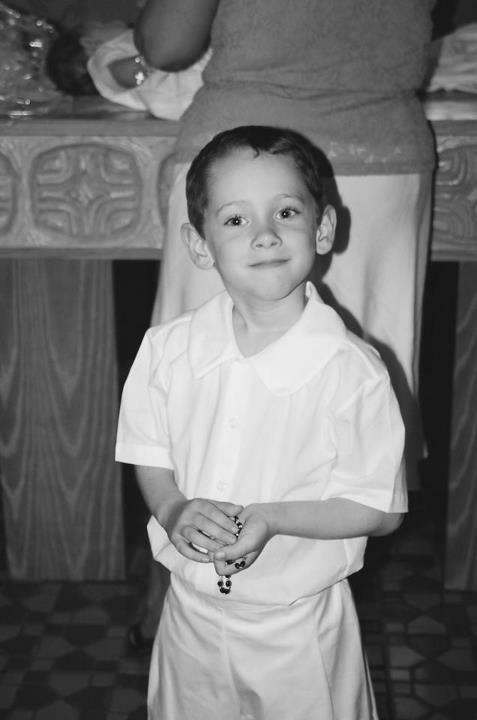 There’s a nice blog post on teaching kids about angels by Kate Daneluk at Catholicmom.com. It’s not a new subject in this house, but one that’s always worth a little sensitive Catechesis. I say sensitive, because many are not well-informed in this teaching. The last thing I want is one of my kids to go to battle to correct a friend that dearly departed Aunt Tilly “ain’t no angel.” Instead, I want them to gently share the teaching about God (hopefully) welcoming her as a saint to share in the eternal banquet. For me, neither the very loud theological hiccup nor the complete syrupy nature of the diminish the ultimate message of the tale and of our Simple Gifts activity: The best gifts are those that come from the heart – whatever they may be. After all, our hearts are a dwelling place for Christ. And a syrupy movie’s got nothing on the sweet purity of a little heart filled with the love of Jesus. As we ready our match sticks for the rose candle and turn the calendar to the half-way mark of Advent, I like this little angel-infused lamp oil. It’s added just the right amount of new and renew for a fruitful season. We’re also still using our treasured Advent candles from a few years ago. Dear me: Can’t you come up with something good for Advent? You don’t have any intention of reinventing Advent – but you do need to breathe some life into the season around here. I know, you’ve done wreaths, candles, Jesse trees, sung O Antiphons, hung O Antiphons, read scripture, colored calendars, you name it. You’ve got 20 years of Advent with kids under that belt and are searching for a fresh way to look at this seasonal gift called waiting. I know you don’t want to revisit last year when you were later putting up the tree in acknowledgement of the “real” Christmas season. But it felt like Christmas passed you by. Everyone else was taking down their trees, and you were just getting started without the benefit of Christmas music on the radio or decorations at the stores. The hat-wearing bell ringers at Kroger had long turned in their red buckets, and you had pockets full of change. You arrived at the party just as everyone was leaving. You were left standing in the picked-over Christmas clearance section of Walmart. So Advent-preparing me, I challenge you to this: Incorporate the joy of the upcoming season while meaningfully embracing the waiting of the soon-to-be-current season. Make it engaging for the littles and not overlooked by the bigs, and try to keep sane with both Advent and Christmas clutter. P.S. Oh, and good luck with that. 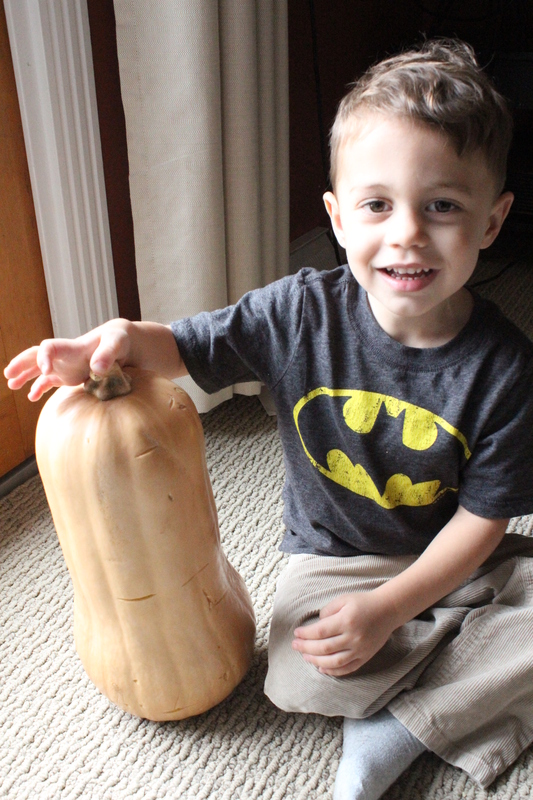 What do you do when you buy a squash half as big as Batman? You make soup. And more soup. And baked squash. And more baked squash. And enjoy. I bought this beautiful Butternut for a whopping $3 when I took the littlest ones on a field trip to the apple-less orchard. (This year’s apple crop in eastern Michigan was nil thanks to that nasty late freeze in the spring.) But the pumpkins and the squash were bountiful, so I loaded up before packing up the car with kids who were all sugared up on a fair share of those yummy fresh cinnamon-y donuts that only seem to exist at cider mills and orchards. I should have put a human by that box to you can see how long that one squash is. That would be two-arm carry for sure. The thing about a giant squash is, it’s giant. You have to put it somewhere before you’re ready to have at it, and when you are ready, you better make time. It takes a long time to slay the thick-skinned beast. You need a plan of attack and a really sharp, and strong knife. 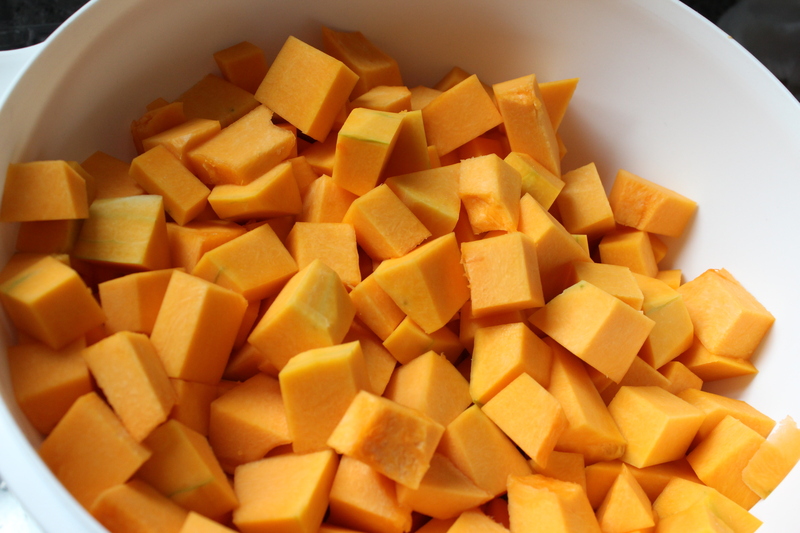 And a Butternut is not like a Hubbard squash. I have no qualms throwing an ugly monster Hubbard on the ground for quick breaking and not-so-quick roasting. I peeled, sliced and diced for about 25 minutes. I don’t have top-chef knife handling skills, and I’d like to keep my fingers. So, speedy, I am not; but careful, I am. That one big squash yielded enough meat to make a double dose of my favorite squash soup recipe from Greenfield Village’s Eagle Tavern, and a full 9×12 of baked squash with butter, brown sugar, lemon zest and nutmeg. My only deviation from the Eagle Tavern recipe is that I used chicken stock instead of veggie, because that’s what I had on hand. The most careful piece of advice I can give with that recipe – and all other squash soup and sauce recipes – is do not overcook the squash. The color seems to change from a soft orange to a more mustard brown. 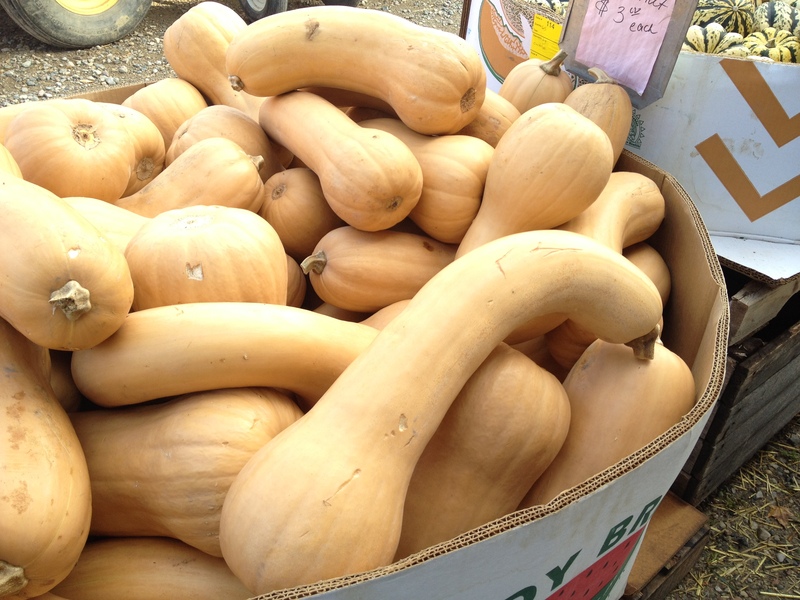 It also seems to diminish some of the “squashiness.” In other words – don’t boil that beautiful squash. The soup was delightful, as always, and I shared it with anyone who would take it. As much as Richard and I love it, the kids, not so much. 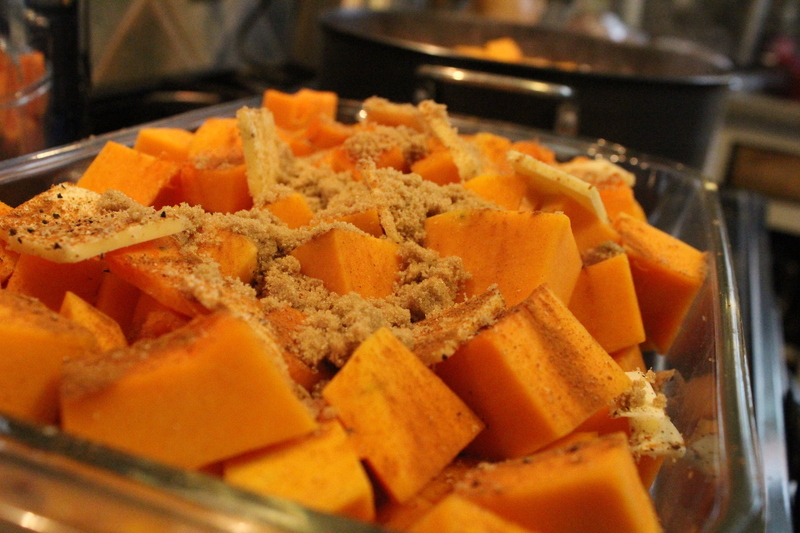 But, they did devour the baked squash, which carried us through a left-overs night, too. 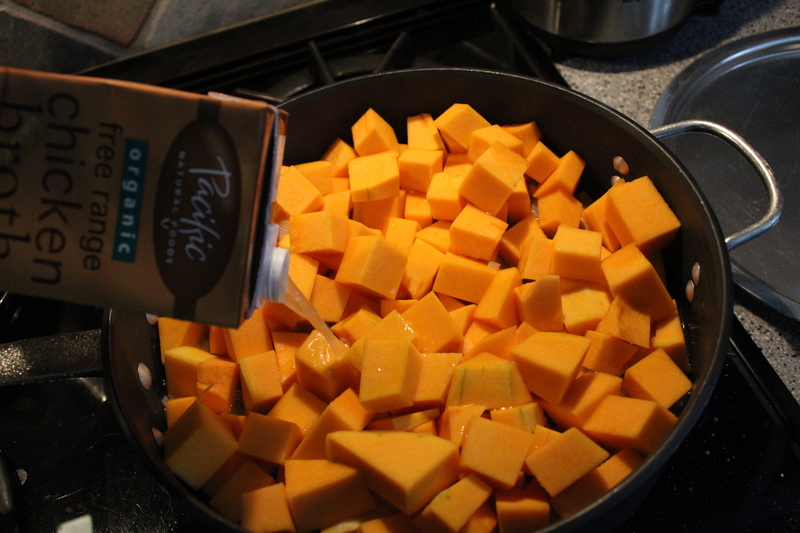 I used about a 1/4 cup of butter, slicing it and just placing it evenly on the squash. Sprinkled with 2 T of brown sugar, a sprinkle of sea salt and then a light dust of freshly ground nutmeg. I covered with aluminum foil and baked at 350 degrees for about 45 minutes (until the squash could be easily pierced with a fork). Then I baked another 10-15 minutes uncovered, for a little more browning and bubbling. It came out perfectly. I much prefer the convenience of smaller, dainty squash – not that a vegetable named squash can actually be considered dainty. But for the price and the energy, this squash was super.